Chief Master Stinson began training in 1981 in Taekwondo and shortly after began training in Hapkido. He currently holds a 7th degree black belt in Hapkido and a 5th degree black belt in Taekwondo. Teaching has been a lifelong endeavor for Master Stinson. He has been teaching martial arts since 1991 in Kentucky. He has a master’s degree in secondary education from Western Kentucky University and has taught high school science since 2004. 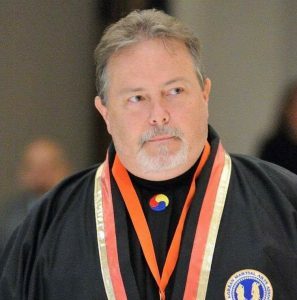 Master Stinson is a state director for the National Korean Martial Arts Association under the direction of GM Rudy Timmerman. He is also an ambassador for the Korean Martial Arts Masters Hall of Fame. In addition to Hapkido and Taekwondo, Master Stinson has trained in Yudo, Jujitsu, Pressure Point Theory, and Tai Chi. During the 1990’s he was certified as a Class A umpire for tournaments. Master Stinson enjoys spending quality time with his wife and two sons and serves on the board of directors for the county inline hockey league.